Many individuals, families and businesses have created funds at Berks County CommunityFoundation to support the causes and organizations they support. If you decide to jointhem and start your own named charitable fund at the Community Foundation, you willbe in good hands. A community foundation is a nonprofit corporation that serves as a civic leader for aregion by developing, managing, and distributing funds to meet existing and emergingcommunity needs. Today, there are more than 700 community foundations across theUnited States. Since Berks County Community Foundation was founded in 1994, we have grown to managehundreds of charitable funds. Each year, those funds distribute grants and scholarships tosupport nonprofit organizations, various causes, and local students. all of the administrative paperwork, and we offer a large tax break, too. We constantly monitor the needs of the community and the impact of your fund. and we encourage you to give to causes you care about. Step One: Determine what you’re passionate about supporting. Some people know right away, while others may want to decide over time. In either case, we are here to help you structure a fund of your own and work with your attorney, accountant, financial advisor or trust officer to make sure it works with your estate plan or current financial goals. Step Two: Sign a fund agreement. Once you decide what you would like to support, you will sign a fund agreement, which is a legally binding document that says you are donating money to the Community Foundation to be used for charity and that the Community Foundation will distribute that money the way you intended both now and in the future. Step Three: Make An Initial Donation. Once you and the Community Foundation sign the fund agreement, you have two choices. First, you can Seed the Fund with an initial tax-deductible contribution of at least $50,000 and begin making grants right away. The second option is to wait to have the fund start until after you pass away, which can reduce the tax burden on your estate. In that case, you must name the fund as a beneficiary in your will, in your life-insurance plan, or other means within your estate. Then, when you die, the fund will begin making grants to the cause or causes you care about in your name. For more information, take a look at our bequest guidelines. Most of the funds at the Community Foundation are endowed funds, which means that each year 4.5% of the fund’s fair market value will be distributed in the manner you specified in your fund agreement. The fair market value is based on the amount you donate plus any investment gains or losses. Please give us a call to sit down and talk about your charitable goals and ideas. There is no obligation, and sometimes we may even recommend that you achieve your charitable goal in a different way. You can reach us at 610-685-2223 or email us at info@bccf.org. FOR A PDF OF THIS GUIDE, CLICK BELOW. From time to time, individuals who created or serve as advisors to charitable funds at Berks County Community Foundation ask to hand-deliver checks to recipients. Please note that this is not permissible: All grant and scholarship distributions from funds at Berks County Community Foundation must be sent via electronic transfer, or mailed to the recipient from the Community Foundation via USPS, or, when necessary, a courier service. To determine the method, or mix of methods, that make the most sense for structuring a gift through Berks County Community Foundation, this information should be reviewed with a competent financial, tax or estate planner. Berks County Community Foundation does not actively seek donations from outside of Pennsylvania. All information on this website related to seeking donations to Berks County Community Foundation is void where prohibited by law. 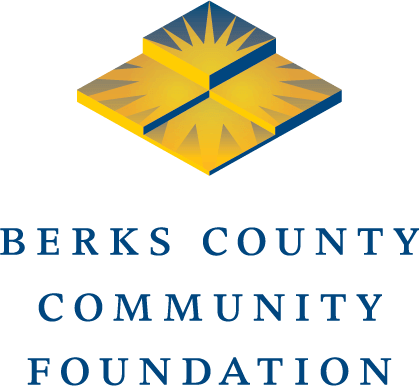 Berks County Community Foundation is a nonprofit 501(c)3 organization that develops, manages and distributes funds for charitable purposes in the community. The official registration and financial information of Berks County Community Foundation may be obtained from the Pennsylvania Department of State by calling toll-free, within Pennsylvania, 1-800-732-0999.